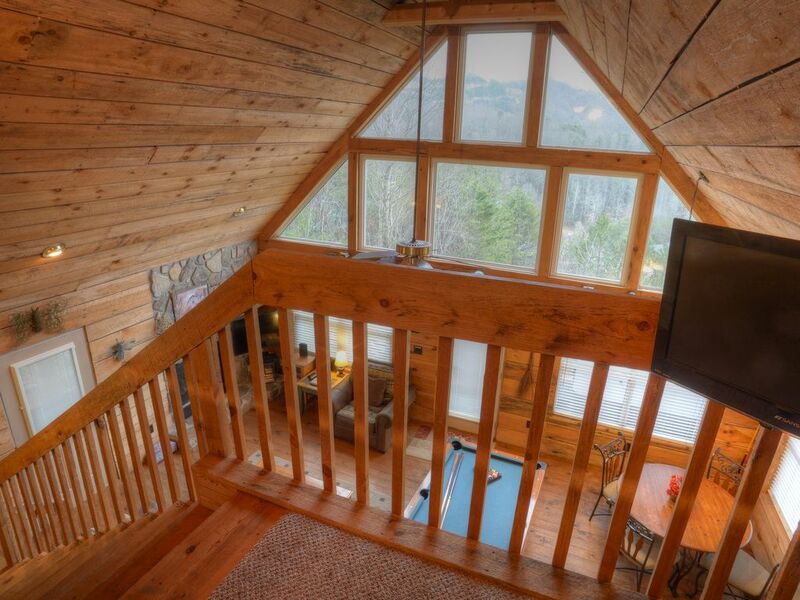 Wow... Tiffany Hallow Cabin has everything you could want in a cabin in the Gatlinburg and Pigeon Forge area. And if that is not enough, we have another cabin right next door (VRBO number 48293) in case you have a group or family gathering. (Between the two cabins, there is sleeping accommodations for 12.) What is more, because we privately-own and manage our cabins, you will be pleasantly surprised by all the extras and special touches. What sets this cabin apart it's large size and it's wall of windows with breathtaking views. Located only 1 mile from Dollywood and Splash Mountain; 3 miles from the main parkway, and minutes from Smoky Mountain National Park. You will love the private location yet convenience to both towns of Pigeon Forge and Gatlinburg. You’ll also appreciate the convenience of being able to take back roads to get to town—you can get to Kroger, Walmart, restaurants and shops without having to get stuck in traffic on the main parkway. Nestled on an over an acre of land, the cabin has a nice mountain view from the decks. You will not find any more privacy this close into town--there are only 4 cabins on our road (we are not in a crowed neighborhood). The cabin is easily accessible in all seasons via paved roads (NO steep-winding roads to drive). King Master Bedrooms with Attached Bathroom—Located on the main level, the master suite has a King Size log bed and super comfortable new mattress with an attached full bathroom. Bedroom has HDTV, alarm clock, reading lamps, ceiling fan. The bed is dressed with luxurious Egyptian cotton luxurious sheets, bamboo blankets (super soft!) and 100% cotton quilts. The Second bedroom-- a loft bedroom with a Queen size bed, an attached private bath upstairs, TV, reading lamp and ceiling fan. This is our favorite room in the cabin! From the loft bedroom, you'll awake to the sun coming over the mountains, refreshed on our comfortable queen bed with a birds-eye view of the fresh morning and mountain views. The bed is dressed with luxurious Egyptian cotton luxurious sheets, bamboo blankets (super soft!) and 100% cotton quilts. The warm, rustic, wood interior and beautiful decor provide the complete cabin experience. We have comfortable sitting room furniture, with a sofa and an over-sized chair. We’ve also added extras to add to your enjoyment--play a game of pool, relax by the natural stone gas fireplace; enjoy a watching your favorite TV show on the large HDTV, or surf the internet with our high-speed WIFI. For extra sleeping accommodations, we have queen-size sofa bed in the main living area. (Kids will love the sofa beds because they can stay up late and watch their favorite shows on Cable TV.) And for the wee little ones we even have a pack-n-play crib! Our kitchen is well-equipped with a high-end coffee maker (Cuisinart Grind and Brew). We have more than ample supply of plates, glasses, forks, etc. so you don't have to wash your breakfast dishes before you eat lunch. We have plenty of pots and pans and baking pans. We also supply many “extras” such as cleaning products, trash bags, sugar, creamer and spices. The Dining area features a large table and 6 chairs. We have a large, wrap around deck, with new rocking chairs. You can sit, rock and relax while you drink your morning coffee or evening cocktail while enjoying the beautiful views. You’ll also find a high-end charcoal cast iron grill. Discover the ultimate treat of soaking in the hot tub on our covered deck after a long, activity-filled day while taking in the beautiful views of the forest and mountains. For your convenience, we also have a washer and dryer, and iron and ironing board - this means you can pack lighter - saving more room for shopping 'finds' at the outlet stores! And if you would like to keep up with friends, family or work while you are away, we provide free high-speed internet via WIFI. We have off-street parking for up to 3 cars. Lastly, our cabins are pet friendly! Any size dogs are welcome (yes, that means we welcome even large dogs). There is a $50 extra fee to bring your dog along and must be pre-approved by the owner. With all the luxuries and extras, you will not want to leave this wonderful cabin. So go ahead... Spoil Yourself! Do not let this one get away! Call or e-mail us if you would like more information. Ask for the owner, Mike, and (please see phone numbers below). Hi, I am Mike. For those that know Christine and Tom, I am Christine's brother. My wife, kids and I wanted to buy a cabin in the Great Smokey Mountains. When looking for cabins to purchase we had 4 things in mind—first we wanted mountain views. (what’s the point of coming to the mountains and not having a view right? ) Also we wanted our cabin to have a private setting (we didn't want to be in a neighborhood where you can put your hand out the window and touch your next-door neighbor.) Next we wanted our cabin to be close to town (we didn’t want to spend 25 minutes to get to the grocery store or to local attractions.) And lastly we wanted a cabin that had the amenities we were looking for (a hot tub on the deck, a pool table and fireplace) We were very fortunate to find a cabin that fit every aspect of our perfect cabin list. The only snafu we ran into was when we went to put an offer on the cabin, the seller said they would not just sell us one cabin. We had to purchase two. After much consideration we decided that it would be really nice to have two cabins right next door to each other. Let’s face it—there are thousands of really nice cabins in the area. What sets us apart is our location. We’re a hop and skip away from many local attractions like Dollywood, the Dixie Stampede and the Great Smokey Mountain National Park. In Pigeon Forge and Gatlinburg the traffic can get a bit out of hand. What’s great about our cabin is easily assessable via back-roads, so you don’t have to spend your vacation waiting in traffic. Fully equipped with lots of extras! Thanks I'm glad you enjoyed your stay. Unfortunately for some odd reason I go through quite a few coffee makers every year. We change them out when notified or the maid see's it's broken. Great little cabin, had everything we needed , hot tub was a perfect end to the day . Rustic charm, nice location, needs updates Small things make Huge differences! We aren’t pool sharks, so we really enjoyed the pool table. Also enjoyed the kitchen table for family game nights! The jacuzzi was great! The owners had a very detailed binder about local info and restaurants as well as a sign in book for renters to use and leave recommendations which we thought was very nice! We read and appreciated them! Thank you for having us! We loved the area and the time we shared as a family! We stayed in this cute cabin for 4 days. While it was quaint and charming it also had some issues. The worst being the upstairs toilet overflowing our 2nd night. A few lightbulbs were out as well. The place was clean but be prepared for a lot of ladybugs inside and out. Our overall stay was good but not if you are picky about everything being brand new. We have stayed at Tiffany Hallow several times. The views are great . The cabin is just the right size for us. It is always clean. I can hear the birds at Parrot Mountain when sitting on the deck. I really enjoy listening to them. Easy access to the Parkway. ANYTIME Special--Stay 6 Nights, 7th Night is FREE! 12.75% TN Sales Tax & Cleaning Fee not included in rate. $50 Pet Fee (Large dogs OK) --------------------------------------------- We require a $200 down payment upon booking. We do NOT require an extra security deposit when you pay via Master Card, Visa or Discover.